There is the funniest story attached to this photograph. The bride’s head is thrown back in a full body laugh and it looks like the bride is simply overcome by the moment: the gorgeous sunny day, marrying her childhood sweetheart and the picture perfect scene with the wrought iron gate and the cascades of flowers all around. In fact, the groom has crept up behind me and was pretending to pinch my backside, which is why she is laughing so hard! .The wedding was at the lovely Club de Golf Saint Raphael. 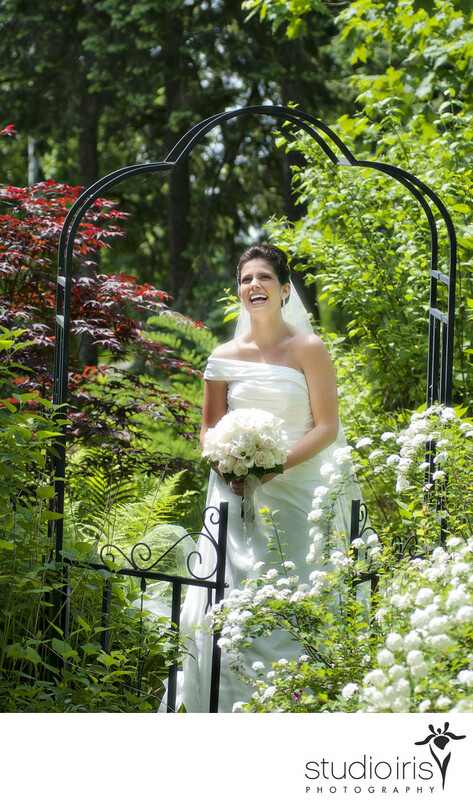 Located less than 30 minutes from Montreal, the Saint Raphael Golf Club is a stunning locale with sweeping vistas, a pretty bridge for photographs and a beautifully landscaped rocky waterfall which is always a great background for wedding pictures. .The couple met in high school, and have been together ever since. Even though they knew each other inside and out, the bride could not stop tearing up during the vows and the groom couldn’t stop smiling the entire day. .Before the ceremony, we got a few photographs of them in front of the Beaconsfield High School where they met, and a few photos on the bridge where they used to smooch. Coming down off the bridge, we ran into their old math teacher on his bike, who was beside himself with delight at meeting his former students in their wedding finery. .The bride was in the final days of her medical residency, so she didn’t have much time for wedding day preparations. This left the groom, a self-described "groomzilla" in charge of the wedding day preparations, including the cute do-it-yourself wedding details. .